Is your piano no longer being played? Don’t want to go through the hassle of selling it yourself or worrying about strangers coming in and out of your home to see your piano? Let Turner’s Keyboards do all the work for you and guide you in the process of selling your piano. Our consignment program for quality pre-owned programs is your best course of action for getting your piano sold. With our one year warranty and 100% trade up to retail value for a lifetime, your piano will be a better choice than those being sold on the internet today. The peace of mind this gives to the purchaser allows the Turner guarantee to add value to your piano. 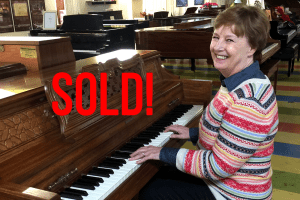 Get Started Selling Your Piano!